This month, firstwriter.com has announced the winner, runners-up, and special commendations of its Seventh International Poetry Competition, as well as releasing Issue 14 of firstwriter.magazine, The Silken Tongue. Anne-Simone Hutton of Najac, France, was announced as the winner of the competition for her poem "Edge", and wins £500 (around $750). Mark Ellis, of London, wins £100 for submitting the best entry from the United Kingdom with his poem "Another Mother", and Michael Pollick of Decatur, Alabama, wins $150 for entering the best runner-up poem from the United States, "Oven". The winning poems can be read online at https://www.firstwriter.com/competitions/poetry_competition/previous_winners/7thpoetry.shtml. The latest issue of firstwriter.magazine has also just been released, featuring quality fiction and poetry submitted from around the world, plus your first chance to see not just the winning story from our Fourth International Short Story Contest, but also all ten Special Commendations. To view the magazine click here. To enter your work in our Fifth International Short Story Contest click here. After months of submitting manuscripts to magazines such as Redbook and Glamour, receiving rejection slip after rejection slip, I started researching the small press publications in hopes of finding a home for some of my material. The result was that I finally started receiving acceptance slips instead of rejection slips – the only difference – there was little or no pay for my hard work. Looking back to my very first piece is almost embarrassing – why would any editor take the time to read that piece of garbage? It was not one of my better pieces of work, I can assure you. But that first piece, as bad as it was, has served as my inspiration more than once, giving me the confidence and boost that I needed to continue writing. When I read it now, full of room for change and improvement (it was worthy of being trashed! ), I am thankful that someone took the time to publish my first piece and give me a chance as a published writer and help me on my journey to succeed as a professional writer. We all have to start somewhere. like a nursery welcomes new babies. Without having learned to write for small press publications years ago, I would not have succeeded as a writer, and I am thankful for getting my foot in the door where and when I did. I would have given up long ago, and my dreams of being a successful writer would be gone forever. Writing is hard work – there are endless hours spent writing and rewriting, the pay is lousy so much of the time, and getting accepted almost seems hopeless. The competition is great – there seems to be no end to it. If you’re having trouble breaking into print with the larger paying markets, try the small press publications. firstwriter.com is updated continually and includes small presses in its publishers section, and small press magazines in its magazines section. Go to www.firstwriter.com/publishers and www.firstwriter.com/magazines to make trial searches for free. If you find markets matching your needs you can get the full details for a low monthly subscription fee by going to www.firstwriter.com/subscribe. You can also ask to receive daily email alerts about new and updated listings matching your interests. Get familiar with some of the smaller markets – SASE for writer’s guidelines and request a sample copy or two before submitting your manuscript. Get a feel for the market – know and understand what is needed and write accordingly. Keep writing and keep sending out manuscripts. Someone will read your manuscript – keep trying until they do! Submissions are being sought for the first volume of the new, biannual Fearless Poetry Series, The Light in Ordinary Things. 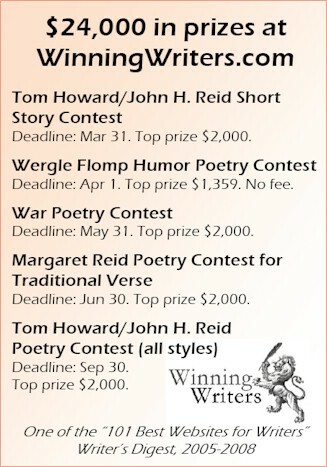 Poets may submit up to three poems and/or prose poems about any ordinary thing, place, event, or living being looked at in a new light, up to May 30, 2009. Inscribed ~ A Magazine for Writers has now become a monthly publication. The latest issue can be downloaded at www.inscribed.org. The 2009 Bridport Prize (the richest competition in the English language) is now open to submissions of short stories up to 5,000 words and poems up to 42 lines. Prizes include two awards of £5,000 (approx. $7,500) for the best story and the best poem. Popular RWA writing workshop guru, Alicia Rasley, is leading an intimate group of writers in The Historic Gettysburg Hotel, March 20-22, 2009. The price is $295, and includes workshop fees and two nights in a double hotel room.